Christie (right) says the new law brings attention to rising tuition costs and heavy student loan debt. New Jersey Gov. Chris Christie has signed legislation inspired by former "Jersey Shore" star Nicole "Snooki" Polizzi to cap what state public universities can pay speakers. The Republican signed the legislation on Monday. He says the new law is essentially symbolic since institutions largely use student activity fees. Christie says the new law brings attention to rising tuition costs and heavy student loan debt. The new law caps the amount of state money that can be spent on speakers at $10,000. 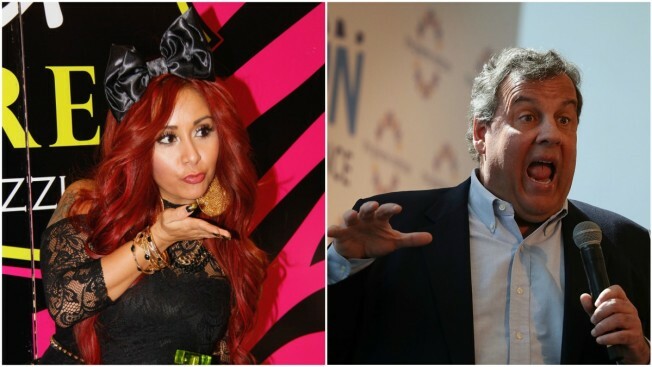 Republican Assemblyman John DiMaio said he was inspired to write the legislation after Snooki was paid $32,000 in student fees to speak at a Rutgers student event in 2011. Musician and actor Steven Van Zandt is being paid $35,000 to speak at Rutgers' commencement Sunday. Rutgers says the money comes from its beverage contract.